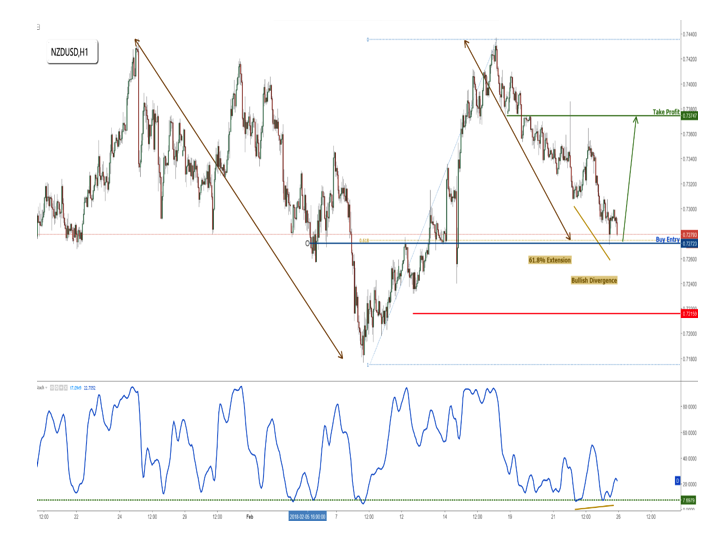 AUDUSD approaching major resistance, prepare for a drop! Sell below 0.8036. Stop loss at 0.8126. Take profit at 0.7894. Price is testing major ascending support and only a break of key support level at 0.8036 (Fibonacci retracement, horizontal overlap support, ascending support, bearish divergence) would trigger a big drop down to 0.7894 support (Fibonacci retracement). RSI (34) is seeing strong support above 46% and also sees bearish divergence vs price signalling that a reversal is impending. Buy above 88.49. Stop loss at 88.19. Take profit at 89.20. Price is approaching major pullback support at 88.49 (Fibonacci retracement, horizontal pullback support) and we are expecting price to test this level before bouncing off nicely to continue its bullish channel exit potential to 89.20 (Fibonacci retracement, Fibonacci extension, horizontal swing high resistance). RSI 934) is seeing a pullback to support level signalling that we could be seeing a bounce soon. Buy above 17.31. Stop loss at 17.16. Take profit at 17.48. Price is now testing major resistance at 17.31 (Fibonacci retracement, horizontal overlap resistance) and we require price to close nicely above this level before triggering a bullish move that should push price up to at least 17.48 resistance (Fibonacci retracement, horizontal overlap resistance). RSI (34) sees an ascending support line hold up our bullish move really well. Sell below 10478. Stop loss at 11223. Take profit at 9328. There continues to be more negative news surrounding Bitcoin and cryptocurrencies as a whole than positive ones. The latest one being the U.S. District Court issuing a temporary restraining order (TRO) freezing BitConnect’s assets as a second lawsuit was filed against the cryptocurrency exchange and lending platform. It now requires the parties to disclose cryptocurrency wallet and trading account addresses, as well as the identities of whom BitConnect has sent digital currencies within the last 90 days. This comes with increasing allegations that the entire exchange is a Ponzi scheme. This big news event has rocked the Bitcoin and cryptocurrency community leading to increasing bearish sentiments surrounding it. Bitcoin continues to test our major major psychological level of 10,000 (also a corresponding horizontal swing low support level). We remain bearish looking to sell below 10478 resistance (horizontal overlap resistance) for a further push down to major support at 9328 (Fibonacci extension, horizontal swing low support). RSI (34) remains under heavy bearish pressure with our descending resistance line. AUDUSD broken major ascending support triggering a bearish move! 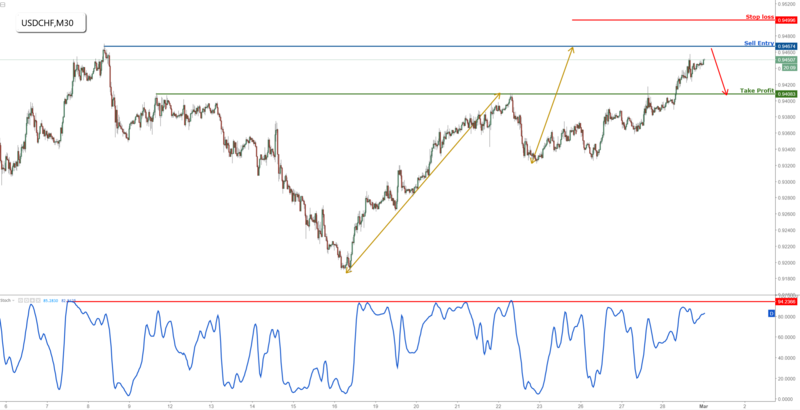 Price has finally broken our major ascending support triggering a bearish move below our pullback resistance at 0.8036 (Fibonacci retracement, horizontal overlap support, ascending support, bearish divergence). We now expect an influx of bearish momentum to see the big drop down to 0.7894 support (Fibonacci retracement). RSI (34) is starting to break our 46% support-turned-resistance level. Sell below 89.23. Stop loss at 89.75. Take profit at 87.83. Price has shot up and reached our profit target perfectly. We are now seeing major resistance at 89.23 (Channel exit potential, horizontal swing high resistance, Fibonacci retracement) and a drop could occur at this level to push price down to 87.83 (Fibonacci extension, horizontal swing low support). It’s important to keep an eye out on 88.48 as intermediate support. Stochastic (34,5,3) is seeing major resistance below 95% where a corresponding reaction could occur. Sell below 109.77. Stop loss at 110.29. Take profit at 108.53. Price has broken out of our channel triggering a bearish exit below 109.77 resistance (Fibonacci retracement, horizontal swing high resistance) for a strong push down to 108.53 support (Fibonacci extension, horizontal swing low support). Stochastic (55,5,3) is seeing a nice reaction off our 96% resistance signalling that a reversal is occurring. We can also see good downside potential for the rest of our move. Buy above 8968. Stop loss at 8591. Take profit at 9898. The big news would be India’s finance minister, Arun, announcing that the government does not view cryptocurrencies as a form of legal tender and would take measures against the tech’s use for illegitimate purposes. This big stance on cryptocurrencies shook many investors and has caused a sell off pushing price beyond the 10,000 psychological level. Bitcoin has dropped absolutely perfectly to our profit target as expected. We are now seeing major support at 8968 (ABC Fibonacci extension, 61.8% Fibonacci extension) and a strong bounce can be expected at this level to correct price up to 9898 resistance (Fibonacci retracement, horizontal pullback resistance, breakout level). Stochastic (34,5,3) is seeing major support at 6.6% where a corresponding bounce could be expected. Sell below 07283. Stop loss at 0.7349. Take profit at 0.7188. Price is now testing major support at 0.7283 (Fibonacci retracement, horizontal swing low support) and only a break of this level would trigger a bearish move to 0.7188 support (Fibonacci retracement, horizontal pullback support). It is worth noting that we can see price break out of our bearish channel triggering a bearish exit. Confirmation of the drop requires price to close below 0.7283. RSI (34) sees a bearish exit of our long term ascending support-turned-resistance line and also a break below our 51% support signalling a big drop from here. Buy above 1.2393. Stop loss at 1.2335. Take profit at 1.2506. 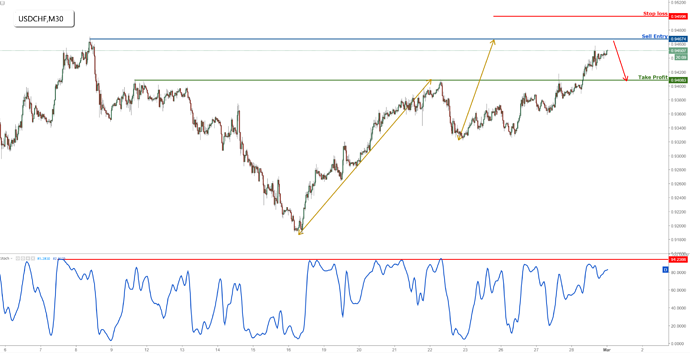 Price has broken major resistance-turned-support at 1.2393 (Fibonacci retracement, horizontal overlap resistance) and we can also see it break out of our long-term descending resistance line signalling that we can expect more bullish momentum. We expect price to make a further push up to 1.2506 resistance (Fibonacci retracement, horizontal overlap resistance). RSI (55) has made a bullish exit signalling a change in momentum to bullish. Sell below 110.42. Stop loss at 111.32. Take profit at 107.62. Price is now testing major resistance at 110.42 (Fibonacci retracement, horizontal overlap resistance, fake channel reintegration) and we expect a strong reaction from here to push price down towards 107.62 support (Fibonacci extension, horizontal swing low support, channel exit potential). RSI (55) sees a descending resistance line hold price down really well and we expect further bearish momentum. Buy above 8098. Stop loss at 7161. Take profit at 9923. The big news surrounding cryptocurrencies would be Bank of America and JP Morgan Chase banning customers from purchasing bitcoin with their credit cards. This was largely due to the concerns about the credit risk of those who make such purchases. Adding on, BoA cited anti-money laundering regulations for the move along with the potential for thieves to convert solten credit cards into cryptocurrency stashes. Bitcoin is now testing major support at 8098 (Multiple ABC Fibonacci extensions, horizontal swing low support, bullish price action) and we expect an intermediate bounce above this level to push price to at least 9923 resistance (Fibonacci retracement, horizontal pullback resistance). Stochastic (34,5,3) is seeing major support above 12% where we expect a corresponding bounce from. Price has finally broken our major support-turned-resistance level at 0.7283 (Fibonacci retracement, horizontal swing low support) triggering a bearish move to 0.7188 support (Fibonacci retracement, horizontal pullback support). Sell below 1.2582. Stop loss at 1.2702. Take profit at 1.2407. Price has shot up and reached our profit target perfectly. We prepare to sell once we reach major resistance at 1.2582 (Fibonacci retracement, horizontal swing high resistance, Fibonacci extension) where a strong reaction should push price down to at least 1.2407 support (Fibonacci retracement, horizontal overlap support). RSI (34) is seeing major resistance at 61% and a strong corresponding reaction could occur from this level soon. Sell below 1.3991. Stop loss at 1.4166. Take profit at 1.3639. Price has formed a double top reversal with major resistance at 1.3991 (Fibonacci retracement, horizontal pullback resistance, breakout level) and we expect a strong drop from this level towards 1.3639 support (Fibonacci retracement, horizontal pullback support). RSI (89) has also made a bearish from our long term ascending support-turned-resistance line signalling that a breakout is expected. Sell below 7993. Stop loss at 8885. Take profit at 5758. Another big news in the cryptoworld is Lloyds Banking Group, which includes Lloyds Bank, Halifax, MBNA and Bank of Scotland, has barred customers from using credit cards to buy bitcoin and other cryptocurrencies. Its decision is over concerns that users may buy cryptocurrencies with credit amid market euphoria and fail to pay the debit balance should the market drop. This is especially since the cryptocurrency market has took a hammering recently, especially bitcoin which as dropped by more than 50% since its $20,000 highs in mid-December 2017. Bitcoin has continued to drop further and has now broke below our descending support-turned-resistance line which signals a further downside acceleration. We look to sell below 7993 resistance (Fibonacci retracement, horizontal pullback resistance, breakout level) for a further push down to at least 5758 support (Fibonacci extension, horizontal swing low support). RSI (34) remains under strong bearish pressure with our long term descending resistance line. Sell below 110.29. Stop loss at 111.29. Take profit at 108.54. Price has dropped perfectly and reached our profit target. We are now seeing a bounce and price approaching major resistance at 110.29 (Fibonacci retracement, Fibonacci extension, horizontal overlap resistance) and a strong reaction could occur from this level to push price down to at least 108.54 support (Fibonacci extension, horizontal swing low support). RSI (34) sees multiple reactions off 63% where we expect a corresponding reaction from once price rises to our selling area. Sell below 87.82. Stop loss at 88.38. Take profit at 86.47. Price is testing major resistance at 87.82 (Fibonacci retracement, horizontal pullback resistance, Fibonacci extension) and we expect to see a strong reaction off this level to push price further down to 86.47 support (Fibonacci extension, horizontal swing low support). Stochastic (21,5,3) is also approaching major resistance at 95% where a corresponding reaction could occur. Sell below 136.15. Stop loss at 136.75. Take profit at 134.62. Price is approaching major resistance at 136.15 (Fibonacci retracement, horizontal overlap resistance, Fibonacci extension) and a strong reaction could occur at this level to drive price down to at least 134.62 support (Fibonacci retracement, Fibonacci extension, horizontal swing low support). Stochastic (34,5,3) is approaching major resistance at 95% where a corresponding reaction could occur. Bank for International Settlements (BIS) chief, Agustin Carstens, has blasted bitcoin as a ponzi scheme, an environmental disaster and a threat to central banks. He further blasted bitcoin by stating that cryptocurrencies fail to meet the basic textbook definition of a currency. The volatility of cryptocurrencies are tolerated mostly by those “who massively evade taxes and launder money”. These statements have cast further doom and gloom about bitcoin as its value continues to drop. Bitcoin has now made a pullback from our support level and is right at our major resistance line once again. This time it is testing our long-term descending resistance and short-term descending resistance. We look to sell below 7993 resistance (Fibonacci retracement, horizontal pullback resistance, breakout level) for a further push down to at least 5758 support (Fibonacci extension, horizontal swing low support). RSI (34) remains under strong bearish pressure with our long-term descending resistance line. Price has reversed perfectly from our selling entry yesterday and is working its way towards our profit target. We remain bearish looking to sell on strength below major resistance at 1.3991 (Fibonacci retracement, horizontal pullback resistance, double top breakout level) for a strong push down to at least 1.3639 support (Fibonacci extension, double top exit potential, horizontal pullback support). RSI (34) has made a bearish exit from its long term ascending support-turn-resistance line signalling that we should be seeing a change in momentum to bearish on GBPUSD. Price is testing major resistance at 1.2582 (Fibonacci retracement, Fibonacci extension, impulsive Elliott wave structure, horizontal swing high resistance) and we expect a strong reaction from this level to drive price down to 1.2407 support (Fibonacci retracement, horizontal overlap support). It’s important to note the intermediate support level at 2.2458 (Fibonacci retracement, breakout level). RSI (34) sees major resistance at 61% where we expect a corresponding reaction from. Sell below 0.7543. Stop loss at 0.7612. Take profit at 0.7416. Price is in a strong bearish channel and we’re expecting more bearish momentum from price. Major resistance remains at 0.7543 (Fibonacci retracement, horizontal overlap resistance, channel resistance) and we expect a drop from here to push price down towards 0.7416 support (Fibonacci extension, horizontal swing low support). Stochastic (34,5,3) is seeing major resistance below 96% where a corresponding reaction is expected. There has been some positive news lately surrounding cryptocurrency, with the latest being Singapore Deputy PM and chairman of Monetary Authority of Singapore (MAS) saying that cryptocurrency and related trading activity currently do not pose any threat to Singapore’s finance system and there is no strong case to ban cryptocurrency trading. Along with that, the optimistic tone set by the U.S. SEC and CFTC at a senate hearing on Tuesday has helped Bitcoin recover a bit. Bitcoin has made a pullback to our major resistance level, tested it and is now reacting nicely off that level. The most immediate resistance we can see on it is our short-term descending resistance line. We look to sell below 7993 resistance (Fibonacci retracement, horizontal pullback resistance, breakout level, short-term descending resistance) for a further push down to at least 5758 support (Fibonacci extension, horizontal swing low support). Price has shot up to test our selling area before reversing nicely once more. We remain bearish looking to sell on strength below major resistance at 1.3991 (Fibonacci retracement, horizontal pullback resistance, double top breakout level) for a strong push down to at least 1.3639 support (Fibonacci extension, double top exit potential, horizontal pullback support). Price is now testing our major resistance area at 1.2582 (Fibonacci retracement, Fibonacci extension, impulsive Elliott wave structure, horizontal swing high resistance) and we expect a strong reaction from this level to drive price down to 1.2407 support (Fibonacci retracement, horizontal overlap support). It’s important to note the intermediate support level at 2.2458 (Fibonacci retracement, breakout level). 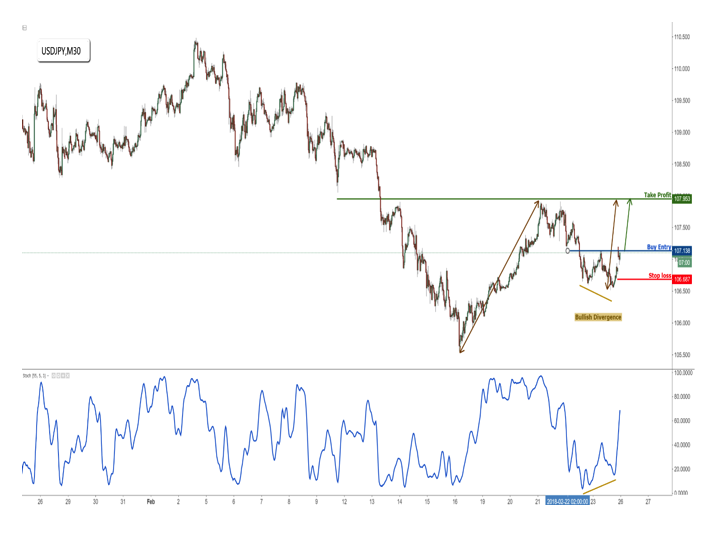 We can also see a new element formed which is the bearish divergence on price vs RSI, this is always a good signal that a reversal is impending and on the horizon. RSI (34) sees major resistance at 61% where we expect a corresponding reaction from. We can also see bearish divergence vs price signalling that a reversal is impending. Buy above 115.90. Stop loss at 115.44. Take profit at 117.10. 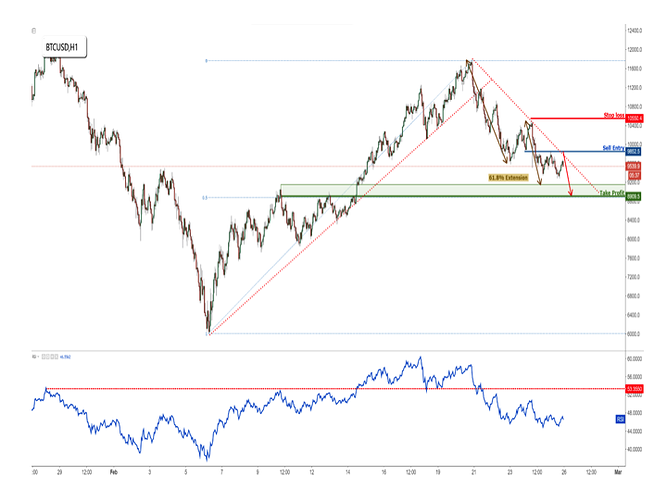 Price is testing major support at 115.90 (61.8% Fibonacci extension, horizontal overlap support, Fibonacci retracement) and we expect a strong bounce from this level to push price up towards 117.10 resistance (50% Fibonacci retracement, horizontal overlap resistance). Stochastic (55,5,3) is seeing major support above 5.9% where we expect a corresponding bounce from. Sell below 8321. Stop loss at 9805. Take profit at 5758. While there has been some good news with Canadian cryptocurrency exchange Coinsquare raising $30 million in new equity financing, there was also the flipside where Hong Kong-based cryptocurrency exchange Binance continues to halt trading and customer withdrawals amongst a blackout – which has sparked fears of another hack which seems to be happening all too often these days. This has caused Bitcoin to come to a standstill in terms of price with the general consensus surrounding it being mainly neutral. Bitcoin remains under strong bearish pressure from our descending resistance line. We look to sell below 8321 resistance (Fibonacci retracement, horizontal pullback resistance, breakout level, descending resistance) for a further push down to at least 5758 support (Fibonacci extension, horizontal swing low support). We’ll be giving this trade a bit more breathing space by moving our stop loss to 9805. Buy above 84.57. Stop loss at 83.63. Take profit at 86.58. Price is now testing major support at 84.57 (Fibonacci retracement, Fibonacci extension, Impulsive Elliott wave structure) and we expect a bounce from here to push price up to at least 86.58 resistance (50% Fibonacci retracement, horizontal overlap resistance, corrective Elliott wave structure). Stochastic (34,5,3) is seeing major support above 6.1% where a corresponding bounce could occur. Sell below 1.2654. Stop loss at 1.2766. Take profit at 1.2270. Price is now testing major resistance at 1.2654 (61.8% Fibonacci retracement, 61.8% Fibonacci extension, Impulsive Elliott wave structure, horizontal overlap resistance, bearish price action) and a strong reaction could occur at this level to push price down towards 1.2270 support (Fibonacci extension, horizontal swing low support). We have to keep a watch out on intermediate support at 1.2382 (Fibonacci retracement, horizontal overlap support) where another bounce might occur. Stochastic (55,5,3) is seeing major resistance at 96% where a corresponding reaction could occur. Sell below 0.9446. Stop loss at 0.9572. Take profit at 0.9264. Price is testing major resistance at 0.9446 (Multiple Fibonacci retracements, horizontal pullback resistance, bearish ichimoku cloud) and we expect a strong reaction from here for price to drop further to 0.9264 support (Fibonacci extension, horizontal swing low support). Stochastic (34,5,3) is seeing major resistance below 98% where a corresponding reaction could occur. News have been slightly positive for Cryptocurrency lately with some encouragement received in the form of Nvidia CEO saying that cryptocurrency is ‘not going to go away’. Along with that, Arizona has cleared a bill that aims to allow residents in the state to pay their taxes with bitcoin and other cryptocurrencies. These are encouraging signs for cryptocurrencies indeed. Bitcoin continues to respect our descending resistance line really well and continues to test our selling entry. We remain bearish looking to sell below 8321 resistance (Fibonacci retracement, horizontal pullback resistance, breakout level, descending resistance) for a further push down to at least 5758 support (Fibonacci extension, horizontal swing low support). RSI (34) remains under strong bearish pressure with our long-term descending resistance line. We can see multiple reactions off our resistance lines and only a break above 56% would signal a bullish recovery. Sell below 0.7470. Stop loss at 0.7528. Take profit at 0.7376. Price is in a strong descending channel and approaching channel resistance once again. We look to sell below 0.7470 resistance (Fibonacci retracement, channel resistance, horizontal overlap resistance) for a further push down to 0.7376 support (Fibonacci extension). Stochastic (34,5,3) is seeing major resistance below 96% where we expect a corresponding reaction from. Price has started to reverse nicely from our selling area. We remain bearish below major resistance at 1.2654 (61.8% Fibonacci retracement, 61.8% Fibonacci extension, Impulsive Elliott wave structure, horizontal overlap resistance, shooting star reversal) and a strong reaction could occur at this level to push price down towards 1.2270 support (Fibonacci extension, horizontal swing low support). We have to keep a watch out on intermediate support at 1.2382 (Fibonacci retracement, horizontal overlap support) where another bounce might occur. Stochastic (89,5,3) is dropping nicely from our 95% resistance level. Sell below 0.7283. Stop loss at 0.7349. Take profit at 0.7188. Price is now in a new descending channel and testing strong resistance. We remain bearish looking to sell below 0.7283 resistance (Fibonacci retracement, horizontal overlap resistance, channel resistance) for a further push down to at least 0.7188 support (Fibonacci retracement, horizontal pullback support). RSI (55) is now below our 51% resistance level signalling that there’s a change in momentum to bearish. There are mixed vibes going around the cryptocurrency market with JPMorgan reporting that one day cryptocurrencies could help investors diversity their equity and bond portfolios while on the other hand, cryptocurrency continues to be plagued with bad news such as piling lawsuits against BitConnect and the recent malware that has exploited over 4,000 visitors’ computers to mine monero. Along with that, we have 3 European Supervisory Authorities that have released a warning on the risks involved with investing in cryptocurrencies. So generally, there’s an air of uncertainty amidst hopeful optimism that Bitcoin would finally pose a recovery. Bitcoin has started to make a bullish exit from our long term descending resistance-turned-support line signalling that there’s a change in momentum to bullish. We now look to buy above major support at 8301 (Fibonacci retracement, horizontal overlap support) for a push up to at least 10273 resistance (Fibonacci retracement, horizontal pullback resistance). RSI (34) has finally made a bullish exit from our long term descending resistance-turned-support line signalling that there’s a change in momentum to bullish. Price is now testing major support at 84.57 (Multiple Fibonacci retracement, horizontal swing low support, Fibonacci extension, Elliott wave structure) and a strong bounce could occur at this level to push price up to at least 86.58 resistance (Fibonacci retracement, horizontal overlap resistance). Stochastic (34,5,3) is seeing strong support above 6.1% where a corresponding bounce could occur. Price has continued to drop nicely since our double top reversal. We remain bearish as we can see an intermediate resistance line holding price down really well. We look to sell on strength below 1.3991 resistance (Fibonacci retracement, horizontal overlap resistance) for a further push down to 1.3639 support (Fibonacci extension, horizontal swing low support, double top exit potential). RSI (34) has made a bearish exit of our long term ascending support-turned-resistance line previously signalling a change in momentum. Price has since broken out of our descending channel but is testing key resistance at 0.7283 (Fibonacci retracement, horizontal overlap resistance, Fibonacci extension, bearish price action). We remain bearish for a further push down to at least 0.7188 support (Fibonacci retracement, horizontal pullback support) from here largely because RSI has not made a move above our 51% resistance level yet. RSI (55) remains below our 51% resistance meaning we should maintain our bearish bias. It’s important to watch for the break above 51% to signal a possible recovery. Buy above 8301. Stop loss at 7499. Take profit at 10273. The most recent news surrounding Bitcoin revolves around Mario Draghi, president of the European Central Bank. He has once again stated that he doesn’t think cryptocurrency is a currency as while the euro’s value is stable, the value of a bitcoin oscillates wildly. On top of that, while the euro is backed by the ECB, dollar by the Federal Reserve, currencies by the central banks or their governments, nobody backs bitcoin. With no legal protections for users who lose their bitcoins to theft and the high transaction costs of using bitcoin, it is very clear that Mario Draghi is not a big fan of Bitcoin and his statements have not given Bitcoin investors much confidence in the currency. Bitcoin has started to make a bullish exit from our long term descending resistance-turned-support line signalling that there’s a change in momentum to bullish. We remain bullish looking to buy above major support at 8301 (Fibonacci retracement, horizontal overlap support) for a push up to at least 10273 resistance (Fibonacci retracement, horizontal pullback resistance). Buy above 0.9264. Stop loss at 0.9199. Take profit at 0.9438. Price has dropped perfectly from our selling area to our profit target. We prepare to buy above major support at 0.9264 (Fibonacci extension, horizontal swing low support, bullish exit) for a bounce up to at least 0.9438 resistance (Fibonacci retracement, horizontal pullback resistance). Stochastic (34,5,3) is seeing major support above 6.5% where a corresponding bounce could occur. Price has made a strong recovery last night and has pushed up to our selling entry once again. We remain bearish looking to selll on strength below 1.3991 resistance (Fibonacci retracement, horizontal overlap resistance) for a further push down to 1.3639 support (Fibonacci extension, horizontal swing low support, double top exit potential). Sell below 1.2490. Stop loss at 1.2561. Take profit at 1.2270. Price has dropped perfectly from our selling area and is now testing major support at 1.2490 (Fibonacci retracement, horizontal overlap support). We would only sell if price drops and closes below this major level. If it does, then the momentum should push price down to at least 1.2382 support before 1.2270 (Fibonacci extension, horizontal swing low support). Stochastic (89,5,3) is seeing a nice reversal from 97% with good downside potential. Buy above 8975. Stop loss at 8181. Take profit at 10273. There has been more positive news about Bitcoin recently with CFTC approving the creation of two subcommittees. One devoted to cryptocurrencies and the other on broader application of distributed ledgers in the finance space. There has also been strong appeal to regulators to boost their involvement in the blockchain and cryptocurrency industries. The general mood after the meeting was one that the CFTC is starting to accept that they need to keep up with the times in managing cryptocurrencies. Bitcoin has rose nicely as expected after breaking our long term descending resistance-turned-support line. We can see that price has broken a short term intermediate descending line too (gold) which signals an acceleration of bullish momentum. We remain bullish above 8975 support (horizontal pullback support, bullish breakout level) for a further push up to 10273 resistance (Fibonacci retracement, horizontal overlap resistance). RSI (34) has also made a bullish exit from its long term descending resistance-turned-support line signalling a change in momentum. Sell below 0.7431. Stop loss at 0.7532. Take profit at 0.7256. Price is testing major resistance at 0.7431 (Fibonacci extension, horizontal swing high resistance) and a strong reaction could occur at this level to push price down towards 0.7256 support (Fibonacci retracement, horizontal swing low support). Stochastic (34,5,3) is seeing major resistance at 95% where a corresponding reaction could occur. Buy above 131.80. Stop loss at 131.12. Take profit at 133.31. Price is now testing major support at 131.80 (Bullish harmonic pattern, horizontal swing low support, bullish price action) and a strong bounce could occur at this level to push price up towards 133.31 resistance (Fibonacci retracement, horizontal swing high resistance). Stochastic (34,5,3) is seeing major support above 6.7% where a corresponding bounce could occur. Sell below 0.7404. Stop loss at 0.7446. Take profit at 0.7318. Price has dropped perfectly as expected and we’re now seeing price test major resistance once again (channel resistance, horizontal overlap resistance, Fibonacci retracement) and a further drop is expected below this level towards 0.7318 support (Fibonacci extension). RSI (89) sees a long term descending resistance line hold the bearish momentum in price really well. Buy above 10356. Stop loss at 9092. Take profit at 12976. Cryptocurrency has risen recently but recent news has poured some cold water on its recovery, especially White House cybersecurity coordinator and special assistant to the present, Rob Royce, saying that legislation around cryptocurrencies is unlikely to materialize anytime soon and that their more immediate concern was with the criminal usage of bitcoin. He emphasized that he considered the irreversibility of bitcoin transactions to be troubling. This has indeed served as a reminder to the community at large that these remain the key issues to solve before bitcoin can see any further major recovery. Bitcoin has rose nicely and has reached our profit target. We can see that an ascending support line is giving it intermediate bullish support and we intend to ride this support up further. We look to buy above 10356 support (horizontal overlap support, ascending support) for a further rise to 12976 resistance (Fibonacci retracement, horizontal overlap resistance). 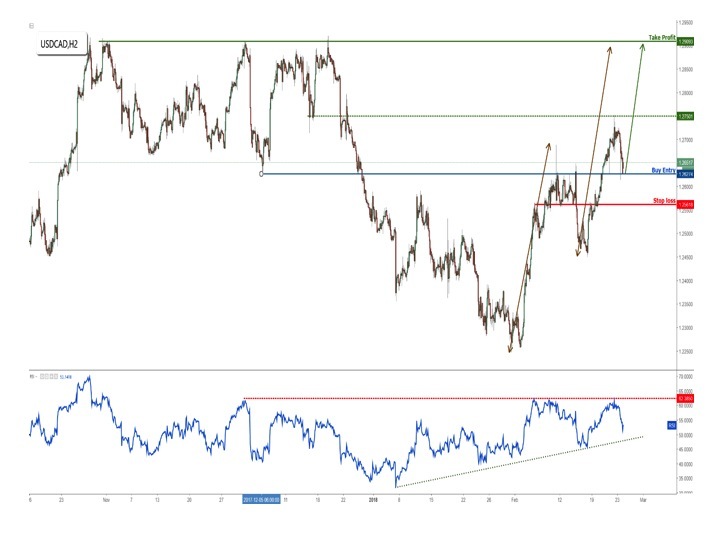 RSI (55) sees an overlap support at 53%which continues to hold our bullish bias. Price has started to fall really nicely from our major resistance level at 0.7431 (Fibonacci extension, horizontal swing high resistance) and we expect further bearish momentum to push price towards 0.7256 support (Fibonacci retracement, horizontal swing low support). Stochastic (34,5,3) is dropping nicely from our major resistance level at 95% and has good downside potential. Price has bounced perfectly from our major support buying level at 131.80 (Bullish harmonic pattern, horizontal swing low support, bullish price action) and we expect price to rise further towards 133.31 resistance (Fibonacci retracement, horizontal swing high resistance). It’s important to note that we have surpassed a major resistance-turned-support level at 132.38 signalling that there is strong bullish momentum. Stochastic (89,5,3) is bouncing nicely off major support at 6.7% with good upside potential. Price is now testing major resistance at 0.7404 (channel resistance, horizontal overlap resistance, Fibonacci retracement) but we’re also seeing that it might be breaking out of our long term descending channel so we have to be careful and monitor price movement. If price starts reacting off our selling area and reintegrates nicely into the channel, then we can expect a further push down towards 0.7318 support (Fibonacci extension). RSI (89) sees a long term descending resistance line hold the bearish momentum in price really well. However we can also see that there is a chance that it is starting to break out so we have to exercise caution and monitor it closely. The latest news surrounding bitcoin involves Israel confirming it will tax bitcoin as a property, meaning that it is treated more as ‘a property, not a currency’, making it therefore taxable as such means profits from cryptocurrencies will be subject to capital gains tax at rates between 20-25%, while individuals mining or trading cryptocurrencies in connection with business must pay a 17% VAT on top of that. This news is not too unexpected, but is a firm reminder on some countries’ stance on cryptocurrencies and might prove to be throwing some cold water on the recent recovery of bitcoin. Bitcoin has continued to rise nicely and bounced from our buying level perfectly yesterday, which also confirms that the market is still obeying our ascending support line. We remain bullish looking to buy on dips above 10356 support (horizontal overlap support, ascending support) for a further rise to 12976 resistance (Fibonacci retracement, horizontal overlap resistance). Intro: USDCAD is seeing a potential reversal as it is testing a major resistance level. Sell below 1.2650. Stop loss at 1.2710. Take profit at 1.2453. Price is testing major resistance at 1.2650 (Fibonacci retracement, horizontal overlap resistance, short term swing high resistance, bearish harmonic formation) and a strong reaction from here would push price down to 1.2453 support (Fibonacci retracement, horizontal overlap support). We have to watch out for intermediate support at 1.2527. Stochastic (34,5,3) is seeing major resistance at 98% where a corresponding reaction could occur. Intro: USDJPY is making a pullback to its previous breakout level, providing a good selling opportunity. Sell below 107.60. Stop loss at 108.96. Take profit at 105.74. Price is approaching major resistance at 107.60 (Fibonacci retracement, horizontal pullback resistance, Fibonacci extension) and a strong reaction from here would push price down to 105.74 support (Fibonacci extension, horizontal swing low support) once again. RSI (89) sees a long term descending resistance line provide downside pressure really well. Intro: CADCHF has made an exit of its channel signalling a change in momentum, and also providing a great opportunity to buy. Buy above 0.7400. Stop loss at 0.7360. Take profit at 0.7493. Price has made a bullish exit of our long term descending channel signalling that we’re likely to see a change in momentum from bearish to bullish. We look to buy above 0.7400 support (Fibonacci retracement, horizontal overlap support) for a push up to at least 0.7493 resistance (Fibonacci retracement, horizontal overlap resistance). RSI (34) has also made a bullish exit of its long term descending resistance-turned-support line signalling a corresponding change in momentum too. Intro: We’re still bullish on bitcoin as long as it remains above our ascending support line. The latest news surrounding cryptocurrency trading comes from South Korea which appears to be softening its stance on cryptocurrency trading. Choe Heuing-sik, governor of the Financial Supervisory Service, has said the government “will support if normal transactions are made.” And will “encourage” banks to work with cryptocurrency exchanges. This would be seen positively by South Korea’s crypto community along with the larger world market. Long term wise, it’s definitely good news for bitcoin as it shows an increasing acceptance to it as long as the proper steps are taken. Bitcoin continued to rise nicely and has made a pullback to our ascending support line strongly. Our bullish bias remains as long as our ascending support line is not broken strongly. We remain bullish looking to buy on dips above 10356 support (horizontal overlap support, ascending support) for a further rise to 12976 resistance (Fibonacci retracement, horizontal overlap resistance). Intro: AUDUSD has been dropping nicely and we’re seeing a strong support area where a bounce might occur. Buy above 0.7731. Stop loss at 0.7633. Take profit at 0.7986. Price is approaching major support at 0.7731 (Fibonacci extension, Fibonacci retracement, horizontal overlap support) and a strong bounce from this level would push price up towards 0.7986 resistance (Fibonacci retracement, horizontal swing high resistance). We have to be careful about intermediate resistance at 0.7890 too. Stochastic (34,5,3) is seeing major support at 0.4% where a corresponding bounce could occur. Intro: USDJPY has made a pullback to its previous breakout resistance and stalling, good entry opportunity. Price has finally made a pullback to our major resistance at 107.60 (Fibonacci retracement, horizontal pullback resistance, Fibonacci extension) and is starting to react off it. We remain bearish looking for price to make a push down to 105.74 support (Fibonacci extension, horizontal swing low support) once again. Intro: CADCHF has made a bullish exit from its long term channel, we maintain our bullish bias unless it reintegrates. Price has made a bullish exit of our long term descending channel signalling that we’re likely to see a change in momentum from bearish to bullish. The important change we’re seeing today is that intermediate ascending support on RSI is starting to provide the bounce required for price to rise further. We look to buy above 0.7400 support (Fibonacci retracement, horizontal overlap support) for a push up to at least 0.7493 resistance (Fibonacci retracement, horizontal overlap resistance). RSI (34) has also made a bullish exit of its long term descending resistance-turned-support line signalling a corresponding change in momentum too. Intermediate ascending support line shows we might be seeing a bounce soon. Intro: Bitcoin has broken its ascending support but requires one more major support to be broken to trigger a sell off. Sell below 10356. Stop loss at 11300. Take profit at 8909. One of the latest news surrounding cryptocurrency is what Venezuelans are saying about their new national cryptocurrency, Petro. This is a big step for government-backed cryptocurrency with the crypto world watching closely on its progress and how well received it is. If everything turns out perfectly, it would spell a great future for cryptocurrencies. However, reviews so far are mixed and even had a stinging attack from Deputy Rafael Guzman saying that “petro is a fraudulent, illegal and invalid mechanism for the government to continue its shady business and money laundering, because it is not known where those resources will come from”. This has instead shed light back onto the key underlying issues with cryptocurrencies and how limiting they can be. Bitcoin has finally broken our ascending support line signalling that there is likely going to be a change in momentum from bullish to bearish. However, we can see major support at 10356 (Fibonacci retracement, horizontal overlap support) and only a break below this level would signal a bearish move all the way down to 8909 support (Fibonacci retracement, horizontal swing high support). RSI (55) has also broken below our 53% support signalling that we’re likely to see a strong drop. The only confirmation we need is price breaking below 10356. Intro: AUDUSD has bounced up nicely since yesterday, however we’re expecting a drop to our major support area first before another stronger bounce. Price has made a small recovery overnight. We’re expecting price to drop today towards our major support at 0.7731 (Fibonacci extension, Fibonacci retracement, horizontal overlap support) where a strong bounce from this level would push price up towards 0.7986 resistance (Fibonacci retracement, horizontal swing high resistance). We have to be careful about intermediate resistance at 0.7890 too. Stochastic (34,5,3) is seeing major support at 0.4% where it is starting to bounce nicely from. Intro: USDJPY has dropped perfectly from our short term channel resistance and is approaching our profit target. We tighten our stop loss as we ride the trade down. Sell below 107.60. Stop loss at 108.02. Take profit at 105.74. 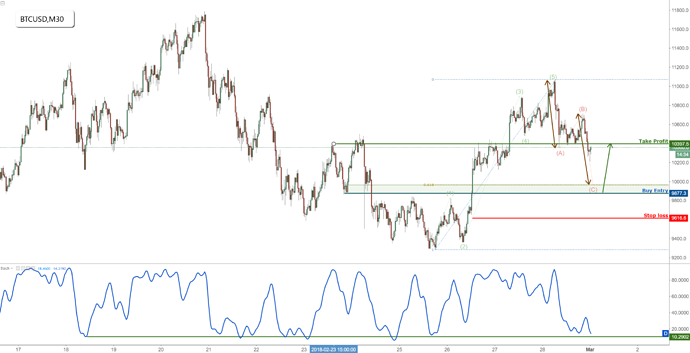 Price has reacted perfectly from our major resistance at 107.60 (Fibonacci retracement, horizontal pullback resistance, Fibonacci extension) and is dropping nicely towards our profit target. We tighten our stop loss to 108.02 to protect our profits and remain bearish looking for price to make a push down to 105.74 support (Fibonacci extension, horizontal swing low support) once again. Intro: USDCAD has broken a major resistance level triggering a bullish move right to the top once again. Look for pullbacks on weakness to get in. Buy above 1.2629. Stop loss at 1.2561. Take profit at 1.2909. Price has made a bullish breakout and we’re looking to buy on dips above 1.2629 support (Fibonacci retracement, horizontal overlap support) for a bounce up to at least 1.2909 resistance (Fibonacci extension, horizontal swing high resistance). We do have to keep an eye out on intermediate resistance at 1.2750 which price has already reacted off nicely once. Only a break of that level would trigger a bigger move up to 1.2909. RSI (34) sees an intermediate ascending support hold up its bullish momentum really nicely, but we’re also seeing major resistance at 61% which needs to be broken to trigger a stronger upside move. Intro: Bitcoin has broke our major support line triggering our bearish move yesterday. We tighten our stop loss to protect our profits while riding this move down. Sell below 10356. Stop loss at 11015. Take profit at 8909. The big news today is the L’Authorite Des Marches Financiers (AMF), which is France’s stock market regulator, has released a statement saying that trading platforms should not be allowed to market cryptocurrency derivative products electronically, per regulations that cover derivatives more broadly. This has caused the wider cryptocurrency market to take a hit on confidence and is casting a bit more gloom over its recent recovery. Bitcoin has finally broken the major support-turned-resistance line at 10356 triggering our bearish move down. We look to sell on strength below major resistance at 10356 (Fibonacci retracement, horizontal overlap resistance, breakout level) for a push down to 8909 support (Fibonacci retracement, horizontal overlap support). We also tighten our stop loss a bit to 11015 to protect our profits while we ride the move down further. RSI (34) remains below our 53% signalling there is a change in momentum to bearish. Intro: We have reached our profit target on NZDUSD and now it’s testing major support. We look to buy for a bounce. Buy above 0.7272. Stop loss at 0.7215. Take profit at 0.7374. Price has dropped perfectly towards our profit target and we’re seeing major support above 0.7272 (Fibonacci retracement, Fibonacci extension, horizontal overlap support, bullish divergence) where a bounce would push price up towards 0.7374 resistance (Fibonacci retracement, horizontal overlap resistance). Stochastic (34,5,3) is seeing major support above 7.6% and also sees bullish divergence vs price signalling that a bounce is impending. Intro: USDJPY is forming a nice intermediate reversal pattern and we look to play the short term recovery. Buy above 107.13. Stop loss at 106.68. Take profit at 107.95. We are seeing USDJPY for a nice reversal pattern and look to buy above 107.13 support (horizontal overlap support, bullish divergence) for a bounce up to at least 107.95 resistance (Fibonacci extension, Fibonacci retracement, horizontal overlap resistance). Stochastic (55,5,3) is bouncing up nicely and also sees bullish divergence vs price, signalling that a recovery is impending. Intro: USDCAD has made a pullback to our breakout level giving us a good opportunity to re-enter into this trade setup. Price has made a nice pullback to our entry and we’re looking to buy above 1.2629 support (Fibonacci retracement, horizontal overlap support) for a bounce up to at least 1.2909 resistance (Fibonacci extension, horizontal swing high resistance). We do have to keep an eye out on intermediate resistance at 1.2750 which price has already reacted off nicely once. Only a break of that level would trigger a bigger move up to 1.2909. 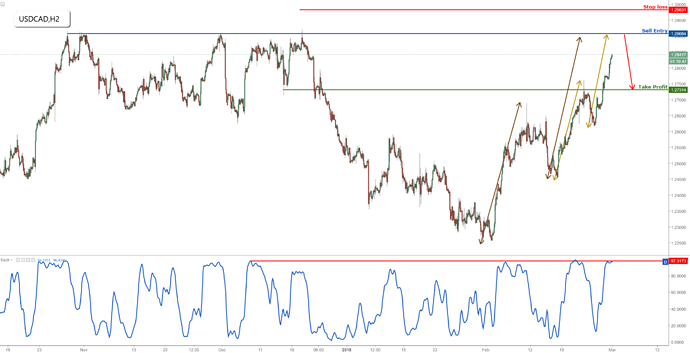 RSI (34) sees an intermediate ascending support hold up its bullish momentum really nicely, but we’re also seeing major resistance at 62% which needs to be broken to trigger a stronger upside move. Intro: Bitcoin has continued to drop nicely towards our profit target, we still expect further bearish pressure albeit quite limited. Sell below 9852. Stop loss at 10550. Take profit at 8909. The big news surrounding cryptocurrency recently is from Bank of America’s annual report. It has expressed particular concern in how cryptocurrencies affect the AML, KYC, sanctions and foreign corruption laws in the U.S. Along with this, Austria has also joined the list of countries planning to regulate cryptocurrencies with the government’s central concern curbing the use of cryptocurrencies for money laundering. All these has shed a bad light on Bitcoin and is casting more doom and gloom about it. Bitcoin has continued to drop nicely from our selling entry and is fast approaching our profit target. We remain bearish looking to sell below 9852 resistance (Fibonacci retracement, horizontal overlap resistance, descending resistance) for a further drop to 8909 support (Fibonacci extension, Fibonacci retracement, horizontal overlap support area). RSI (34) remains below our 53% resistance level signalling that we’re still in a bearish setup. Intro: We are seeing AUDUSD approach strong resistance at 0.7890 where a strong drop could occur from. Sell below 0.7890. Stop loss at 0.7942. Take profit at 0.7769. Price is approaching strong resistance at 0.7890 (Fibonacci retracement, horizontal overlap resistance, Fibonacci extension, bearish price action) and a strong reaction could occur at this level to push price down to 0.7769 support (Fibonacci extension, horizontal swing low support). Stochastic (34,5,3) is seeing major resistance below 97% where a corresponding reaction could occur. Intro: GBPUSD is facing strong downside pressure, good to watch out for selling opportunities. Sell below 1.4064. Stop loss at 1.4166. Take profit at 1.3639. We are seeing heavy downside pressure on GBPUSD with its descending resistance line. We remain bearish below 1.4064 resistance (Fibonacci retracement, horizontal swing high resistance, descending resistance) for a further push down to 1.3639 support (Fibonacci retracement, Fibonacci extension, horizontal pullback support). Stochastic (34,5,3) is seeing major resistance below 94% where a corresponding reaction could occur. Intro: USDCHF is testing some really strong resistance now, good opportunity to start going short. Sell below 0.9390. Stop loss at 0.9415. Take profit at 0.9321. Price is testing major resistance at 0.9390 (Fibonacci extension, bearish harmonic formation, descending resistance) and a strong reaction could occur at this level to push price down to 0.9321 support (Fibonacci retracement, horizontal overlap support). Stochastic (34,5,3) is seeing major resistance at 93% where a corresponding reaction could occur. Intro: Bitcoin is just about to reach a strong resistance level, good opportunity to short. Sell below 10520. Stop loss at 10991. Take profit at 8909. The major news announcement surrounding bitcoin would be the release of the much-anticipated version 0.16.0 Bitcoin Core which has added full support for Segregated Witness (SegWit), which was largely intended to solve bitcoin’s scalability obstacles. This has helped bitcoin pose a nice recovery yesterday bringing price up to the 10,000 mark. Bitcoin is approaching major resistance at 10520 (Fibonacci retracement, horizontal swing high resistance, bearish harmonic formation) and a strong reaction could occur at this level to push price down to 8909 support (Fibonacci extension, horizontal pullback support). Stochastic (34,5,3) is seeing major resistance at 96% where a corresponding reaction could occur. Intro: USDCAD is now above a major support level and has a lot of bullish momentum. Good opportunity to buy. Buy above 1.2731. Stop loss at 1.2606. Take profit at 1.2908. Price has broken major support-turned-resistance at 1.2731 (horizontal overlap support, bullish Ichimoku cloud) and we expect to see a bullish acceleration from here to push price upwards towards 1.2908 resistance (Fibonacci extension, horizontal swing high resistance). RSI (34) sees an ascending support line hold up our bullish momentum really well while seeing strong resistance at 62%. Only a break of our 62% level would trigger a stronger rise in price. Intro: GBPUSD can expect a bearish acceleration after making a bearish exit from our triangle formation. Price has finally made a bearish exit from our triangle formation signalling a bearish acceleration from here. We are also seeing heavy downside pressure on GBPUSD with its descending resistance line. We remain bearish below 1.4064 resistance (Fibonacci retracement, horizontal swing high resistance, descending resistance) for a further push down to 1.3639 support (Fibonacci retracement, Fibonacci extension, horizontal pullback support). 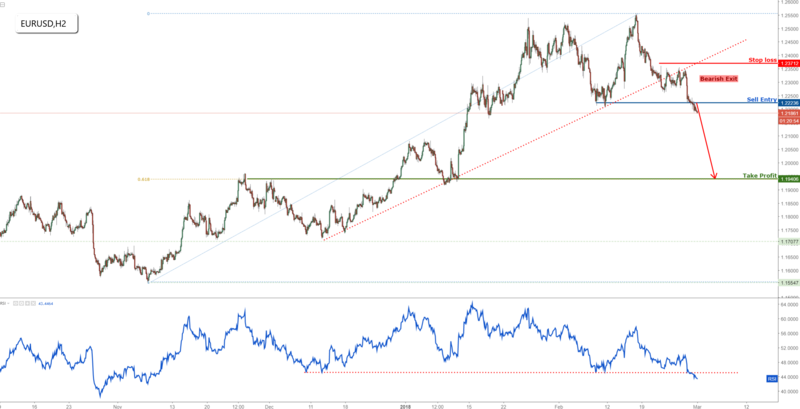 RSI (34) sees a descending resistance line continue to hold prices down really well. Our short term ascending support line needs to be broken to open a bigger move down. Intro: USDCHF has broken our strong descending resistance line, huge potential for a rise from here. Buy above 0.9406. Stop loss at 0.9377. Take profit at 0.9462. Price has broken major descending resistance-turned-support line signalling a possible rise from here. However, we’re still seeing major resistance at 0.9406 (horizontal swing high resistance, Fibonacci retracement) and price needs to break this level to open a strong move upwards towards 0.9462 resistance (Fibonacci extension, horizontal swing high resistance). We’re seeing Ichimoku clouds support our recent bullish sentiment so a close above our buy entry would be in line with the bullish momentum we’re expecting. RSI (55) has made a similar bullish exit signalling that we’re starting to see a change in momentum from bearish to bullish. Intro: Bitcoin is reversing nicely below our resistance, potential for a big drop. Sell below 10826. Stop loss at 10991. Take profit at 8909. There has been more positive news surrounding cryptocurrencies recently with Venezuela president saying the government has received more than 171,000 certified purchase orders for the petro, the country’s forthcoming cryptocurrency. There has also been good news from Goldman Sachs with the CIO striking a more positive note on the topic of a central bank-backed cryptocurrency, even going as far to say that they would be more useful than the coins in existence today. Price has risen further and has reacted nicely below our stop loss level and is dropping nicely. We remain bearish below 10826 resistance (Fibonacci retracement, Fibonacci extension, horizontal overlap resistance, Elliott wave structure) for a push down to 10131 support (Fibonacci retracement, horizontal swing low support). Intro: USDCAD has risen strongly towards our profit target, we prepare to sell once it hits major resistance. Sell below 1.2908. Stop loss at 1.2983. Take profit at 1.2731. Price has shot up from our buying level towards our profit target as expected. We prepare to sell once price reaches major resistance at 1.2908 (multiple Fibonacci extension, horizontal swing high resistance) for a drop towards 1.2731 support (Fibonacci retracement, horizontal overlap support). Stochastic (34,5,3) is seeing major resistance at 97% where a corresponding reaction could occur. Intro: EURUSD has finally broken a very strong support level, opening a potentially mega drop from here. Sell below 1.2223. Stop loss at 1.2371. Take profit at 1.1940. Price has finally broken a major support level at 1.2223 (Fibonacci retracement, horizontal swing low support) after breaking our long term ascending support-turned-resistance line. This has triggered a strong bearish exit from here that is likely to push price down towards 1.1940 support (Fibonacci retracement, horizontal overlap support). RSI (34) has also made a similar bearish exit signalling that we are likely to see a strong drop from ehre. Intro: USDCHF has reached our profit target bagging us some good pips. We prepare to sell as we’re approaching strong resistance. Sell below 0.9467. Stop loss at 0.9499. Take profit at 0.9408. Price has shot up perfectly from our buying level yesterday and has reached our profit target. We prepare to sell below major resistance at 0.9467 (Fibonacci extension, horizontal swing high resistance) where a strong reaction would drive price down to 0.9408 support (Fibonacci retracement, horizontal pullback support). Stochastic (34,5,3) is seeing major resistance at 94% where a corresponding reaction could occur. Intro: Bitcoin has dropped as expected and is fast approaching strong support where a bounce is likely to occur. Buy above 9877. Stop loss at 9616. Take profit at 10397. We have had mixed news on the cryptocurrency front recently with the Lithuania Banking Association warns its residents over crypto investments and has basically gave it a vote of no confidence. However, on the other hand, CFTC has finally given the green light for employees to trade cryptocurrency after it had received numerous inquiries from employees about whether they could do so. This comes as a huge showing of support from the public point of view. Price has dropped strongly since yesterday and is fast approaching our major support level at 9877 (Fibonacci retracement, Fibonacci extension, horizontal overlap support, Elliott wave structure) where a bounce is likely to occur to push price up towards 10397 resistance (Fibonacci retracement, horizontal overlap resistance). Stochastic (34,5,3) is seeing major support above 10% where a corresponding bounce could occur.